In 1831, Michael Faraday, an English physicist gave one of the most basic laws of electromagnetism called Faraday's law of electromagnetic induction. This law explains the working principle of most of the electrical motors, generators, electrical transformers and inductors . This law shows the relationship between electric circuit and magnetic field. Faraday performs an experiment with a magnet and coil. During this experiment, he found how emf is induced in the coil when flux linked with it changes.This law is included under the subject of Basic Electrical and Electronics for Automobile Engg Diploma college in Pimpri Chinchwad. In this experiment, Faraday takes a magnet and a coil and connects a galvanometer across the coil. At starting, the magnet is at rest, so there is no deflection in the galvanometer i.e needle of galvanometer is at the center or zero position. When the magnet is moved towards the coil, the needle of galvanometer deflects in one direction. When the magnet is held stationary at that position, the needle of galvanometer returns back to zero position. Now when the magnet is moved away from the coil, there is some deflection in the needle but in opposite direction and again when the magnet becomes stationary, at that point with respect to coil, the needle of the galvanometer returns back to the zero position. 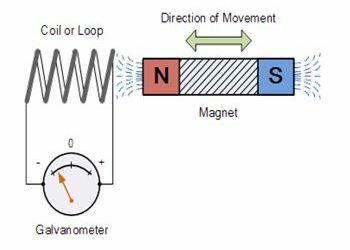 Similarly, if magnet is held stationary and the coil is moved away and towards the magnet, the galvanometer shows deflection in similar manner. It is also seen that, the faster the change in the magnetic field, the greater will be the induced emf or voltage in the coil. CONCLUSION: From this experiment, Faraday concluded that whenever there is relative motion between conductor and a magnetic field, the flux linkage with a coil changes and this change in flux induces a voltage across a coil. Michael Faraday formulated two laws on the basis of above experiments. These laws are called Faraday's laws of electromagnetic induction. 2. By moving the coil into or out of the magnetic field. 4. By rotating the coil relative to the magnet. It states that the magnitude of emf induced in the coil is equal to the rate of change of flux that linkages with the coil. The flux linkage of the coil is the product of number of turns in the coil and flux associated with the coil. Faraday law is one of the most basic and important laws of electromagnetism . This law finds its application in most of the electrical machines, industries and medical field etc. 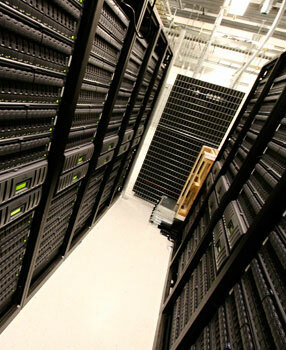 Electrical Transformers It is a static ac device which is used to either step up or step down voltage or current. It is used in generating station, transmission and distribution system. The transformer works on Faraday's law. Electrical Generators The basic working principle of electrical generator is Faraday's law of mutual induction. Electric generator is used to convert mechanical energy into electrical energy. Induction Cookers The Induction cooker, is a most fastest way of cooking. It also works on principle of mutual induction. When current flows through the coil of copper wire placed below a cooking container, it produces a changing magnetic field. This alternating or changing magnetic field induces an emf and hence the current in the conductive container, and we know that flow of current always produces heat in it. Electromagnetic Flow Meters It is used to measure velocity of blood and certain fluids. When a magnetic field is applied to electrically insulated pipe in which conducting fluids are flowing, then according to Faraday's law, an electromotive force is induced in it. This induced emf is proportional to velocity of fluid flowing . Musical Instruments It is also used in musical instruments like electric guitar, electric violin etc.